Care for a side of mac n' cheese with your sustainable architecture? Then pop on down to the Ditch Plains Drop-In, an outpost of the acclaimed NYC restaurant that offers customers a very unusual topping - a brambly green roof. Situated at the entrance of Brooklyn Bridge Park, right near the ferry pier, the pop-up restaurant box serves a selection of the delectable surf-style bites you can find at its sister locations in the city, takeout-style. The Ditch Plains Drop-In is a nice departure from your standard in-park concessions in both the fare it offers as well as its aesthetic appeal. Its sloping profile is almost hill-like in its appearance, with a free-growing green roof that keeps the interior a lot cooler in the burning sun than a regular metal hot dog cart. Visitors to Brooklyn Bridge Park won’t have to look very far to find the Drop-In, and can stop by for some refreshing lemonade, iced tea or if they’re feeling peckish, nosh on chef Marc Murphy’s irresistible lobster rolls, Vietnamese wraps or Ditch Dogs smothered in macaroni and cheese. The Ditch Plains Drop-In usually opens around 11am, but check on their Facebook page daily to make sure they’re open before you go. 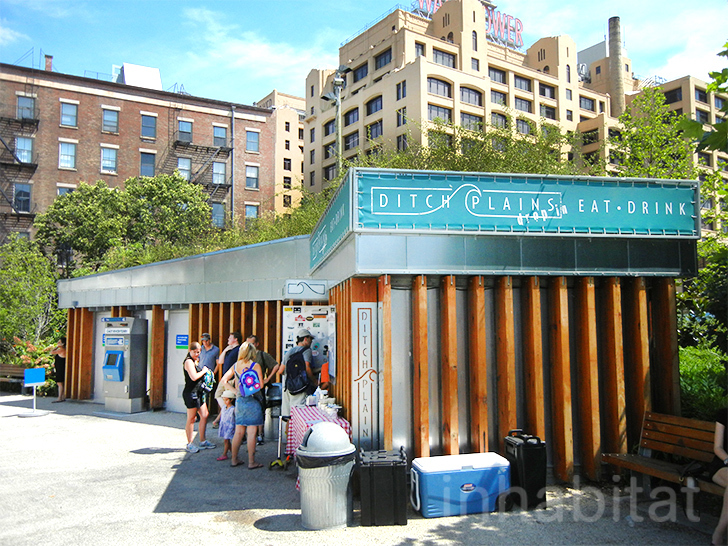 The Ditch Plains Drop-In is a nice departure from your standard in-park concessions in both the fare it offers as well as its aesthetic appeal. Its sloping profile is almost hill-like in its appearance, with a free-growing green roof that keeps the interior a lot cooler in the burning sun than a regular metal hot dog cart. Visitors to Brooklyn Bridge Park won't have to look very far to find the Drop-In, which is right near the entrance. If you're thirsty, stop by for some refreshing lemonade or iced tea. Or if you're feeling peckish, nosh on chef Marc Murphy's irresistible lobster rolls, Vietnamese wraps or Ditch Dogs smothered in macaroni and cheese. The walls of the Drop-In are very unique, with a layer or thin metal overlaid by wooden planks. The structure also provides shade for customers lining up to purchase food. A closer look at the brambly green roof. Customers line up for some surf-style bites to go. Every order comes with a side of this beautiful view. And if you walk a little further down, this one too. The Ditch Plains Drop-In usually opens around 11am, but check on their Facebook page daily to make sure they're open before you go.